The Washtenaw Ski Touring Club has announced its trip schedule for the winter of 2017 - 2018. The trip committee has decided to start trip sign-ups at the upcoming Fall potluck on Sunday, October 22nd. Trip Sign-up begins at the Fall Potluck, October 22, 2017. You must be a WSTC member to go on trips. All trips except Stokely require a WSTC Trip sign-up form. Most trip write-ups have instructions for making your own lodging reservations. If not, a check to WSTC for the trip price must accompany the form. Give the form to the trip coordinator before making reservations. No refunds after the Cancellation Date unless the reservation is taken by someone else, or a refund is given by the hotel/motel/inn. See the complete refund policy on the trip sign-up form. Let’s revisit the Blueberry Ridge trails to check out the new warming hut. Other places we can ski include the Noquemanon Trail, and the Presque Isle Park trail along Lake Superior. Lodging: Econo Lodge Lakeside, 2050 S. US 41, Marquette, MI, 49855, 906-225-1305 A block of ten rooms has been reserved for ‘WSTC’. Trippers call the motel to make their own reservations. All rooms have small fridges; microwaves available; use of a large fridge. Meals: Free continental breakfast in motel. There are wonderful restaurants in downtown Marquette. Bring trail food. Price: per room per night not including 12% tax: $74 (2 doubles), $79 (2 queens), $84 (1 king). Confirmation Date: Reserve room with motel by December 24, 2017. Cancellation Date: Notify motel by 3:00 pm January 2, 2018. Enjoy having a three-day weekend to explore the many trails in the Grayling area! There are six groomed ski areas and miles of un-groomed public lands for cross country skiing, skijoring, snowshoeing, and adventure skiing. 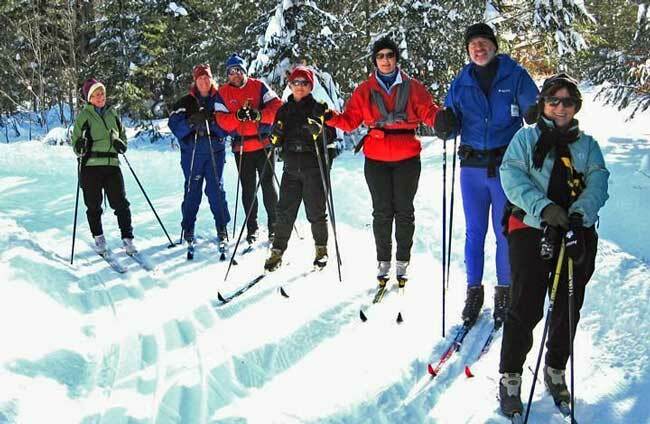 Cross Country Ski Headquarters, Forbush Corner, Hanson Hills, Hartwick Pines State Park and Mason Tract Pathway offer over 100 K of well-groomed, scenic beginner to advanced trails. We'll have pre-dinner socials at the hotel on Saturday and Sunday, so bring your favorite beverage, and a snack/appetizer to share. Visit The Cross-Country Ski Shop or XC HQ for great selections of clothing, equipment, ski rentals/demos, etc. Lodging: Days Inn Grayling, 2556 Business Loop South, Grayling, MI 49738, 1-989-344-0204. Call hotel for reservations by December 28; 12 rooms are being held under 'Washtenaw Ski’. Meals: Light hotel breakfast included with room. Trail lunch/snacks on your own. Restaurant dinners. Planned spots for group skiing & dinners, but you’re free to follow your own agenda. Price: (per room per night) $80 + tax for 2 queens, $85 + tax for 1 King. A Michigan recreation passport may be required. Ski and park fees - on your own. Cancellation Date: Ask Days Inn about cancellation policy. Experience four days of skiing and good food at Stokely Creek Lodge on the Niagara Escarpment. The 120 km of ski trails offer views of lakes, streams, forest, and incredible solitude. Stokely is rated one of the best ski & snow shoe destinations in North America. This is an on-your-own trip. WSTC Trip sign-up form not required. Lodging: Stokely Creek Lodge, RR1, 194 Pickard Rd, Goulais River, ON, Canada. Contact Stokely to reserve your room. 705-866-STOKELY http://www.stokelycreek.com. Trip Coordinator will give lodging availability updates. Meals & Price: CA $150 - $190 plus 13% tax (approximate - check stokelycreek.com) per person per day; rate based on number in room & accommodation chosen. Includes 3 meals/day and trail fees. Spend a pleasant weekend in Petoskey’s historic Victorian Bayview area. Get in plenty of skiing too! We will choose from Boyne, Wildwood, Douglas Lake, or DNR/National Forest trails. Most Bayview streets will be closed and skiable, allowing you to ski to the Bayview woods. Ice skate on the pond at nearby Petoskey Winter Sports Park. If conditions are right, you can ski to downtown Petoskey. Lodging: Terrace Inn, 1549 Glendale Ave., Bay View, Petoskey, MI www.theterraceinn.com. Contact the trip coordinator for reservation instructions. Meals Hot breakfast buffet included in price, dinners in restaurants. Refrigerator available. Bring your own trail lunches. Price: $109.89 per room per night including tax. Ten ‘cottage’ rooms (one queen or two twins) are being held. Trail fees extra. Cancellation Date: Contact the trip coordinator for information. Lodging: Borchers Lodge, 101 Maple St., Grayling, MI 49738 http://www.canoeborchers.com Meals Breakfast included. Potluck dinners. Pack your own lunch or buy at ski area, if available. Price: per room for 2 nights: $210, 2 queens, private bath; $190, 1 queen & cot, private bath. First-come first-served. Cancellation Date: January 3, 2018. Ski the Vasa Trail nearby, and other shorter trail options in the area (the Muncie Lakes Pathway and Sleeping Bear Trails). We’ll stay at the Comfort Inn which is ~2 miles from downtown. As a side-trip, we will arrange a tour of the Coast Guard Air Station at the airport on Friday afternoon. Lodging: Comfort Inn Traverse City 460 Munson Avenue, Traverse City, 49686 Tel 231-778-9000. Meals Many restaurants in downtown Traverse City. Two group dinners. Price: $80 + 11% taxes per room/night (3 nights = $267) or just choose the weekend …. Maximum: No maximum or minimum for this trip. We are holding a block of 10 rooms until January 1st. Please contact Kay or Anne to provide your WSTC trip form and get the group name. Then, call the hotel directly (231-778-9000) to reserve one of the rooms in this block. Cancellation Date: The block of rooms will be held at this price until January 1st. Individual reservations must cancel earlier than 24 hours before arrival. We will go regardless! Our first goal will be to ski the Corsair Trails northwest of Tawas. Corsair, in the middle of the Huron National Forest, has 35 groomed miles of diverse terrain, with fun-to-ski rolling hills. Nearby is the un-groomed Highbanks Trail along the Au Sable River. Trail info, ski and snowshoe rentals available at Nordic Sports in East Tawas www.n-sport.com/ If the snow clouds fail Corsair, we can head further north to Black Mountain. We will go as far we have to for snow, preferably on the eastern side of the Mitten. ‘As far as we have to’ extends to Mackinac and Sault Ste. Marie. Let’s go somewhere we haven’t been to in awhile! Lodging: To be determined later. Trippers will make their own reservations from a block of rooms reserved by the trip coordinator. Meals: In restaurants and/or lodging. Confirmation Date: Please express interest by January 31, 2018. Turn in your trip sign-up form to get on the participant list. Cancellation Date: Check with the Motel. Enjoy four days of spring skiing in the U.P., where the snow should be plentiful and the temps moderating. Spend Monday night in St. Ignace. Early rise Tuesday to ski the day at Sand Dunes (Brevort), after which we drive to our base lodge in Curtis. A short drive from Curtis each day takes us to Canada Lakes (Newberry), Paradise Pathway/ Tahquamenon Falls (Paradise) and Northern Hardwoods (Seney). Each has 6 to 9 miles of backcountry trails, with lots of options. (DNR trails only groomed on the weekends.) After skiing at Seney Friday, head to Munising for the weekend to join the Valley Spur trip, or else head home. Lodging: Quality Inn, St. Ignace - 8 rooms reserved under ‘WSTC’. 561 Boulevard Drive, Saint Ignace, MI, 49781 Phone: (906) 643-9700 In Curtis, we stay 3 nights at Chamberlin’s Ole Forest Inn (http://www.chamberlinsinn.com/), a 3 story historic lodge on Manistique Lake. 8 rooms reserved; 5 with private baths; 3 with shared baths and sink in the room. Meals: Breakfasts included in room prices; other meals and trail lunches/snacks on your own. Restaurant dinners. Casual fine dining or pub food on site at Chamberlin’s. Cancellation Date: Monday, February 12, 2018 by 4:00 p.m.
We’re heading to Munising for the annual Taste and Glide event at beautiful Valley Spur in the Hiawatha National Forest. Trail sponsors place lunch foods and desserts at various locations on the 2.8 mile ‘B’ (beginner) trail system. Hot food and live music will be located in the Lodge. On Sunday an experienced guide will lead the ½ mile trip across the straits to the magical ice caves on the thumb of Grand Island. Recreational skis are adequate. If conditions do not allow access to the island a back county trip to the Council Lake chain of lakes is planned. Lodging: to be chosen later. A block of rooms will be reserved at a group rate. Be sure to turn in your trip sign-up form to get on the participant list. Meals: in restaurants, bring your own trail snacks. Price: Pay for your own lodging and meals. Approximately $20 for Taste and Glide including ski pass; possible trail fees/donations on other trails.